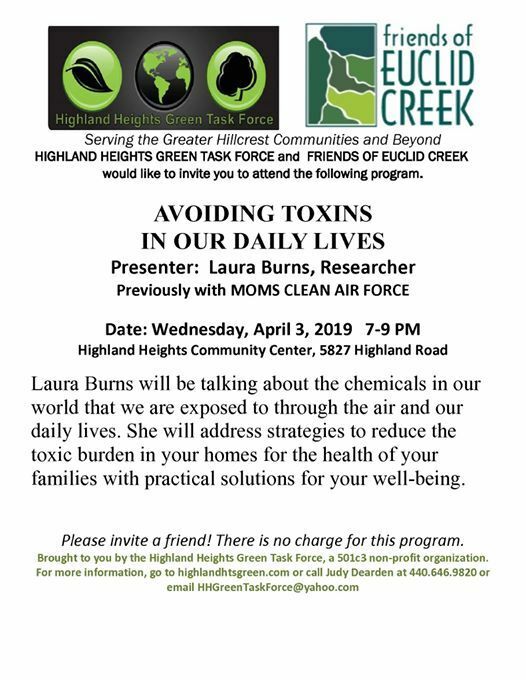 Please join us at Highland Heights Community Center for this Joint Highland Heights Green Task Force and Friends of Euclid Creek Meeting where we will hear from presenter Laura Burns (previously with Moms Clean Air Force). 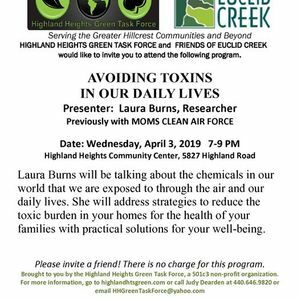 Laura Burns will be talking about the chemicals in our world that we are exposed to through the air and our daily lives. She will address strategies to reduce the toxic burden in your homes for the health of your families with practical solutions for your well-being. Laura has a Bachelors of Science in Biology and worked as a biologist in a research lab for several years. Her experiences in research served to confirm her commitment to environmental health. She’s a passionate Clean Air activist. When she’s not talking to people about air quality and pollution, Laura spends her time with her husband and two children: homeschooling, building with Legos, practicing ballet, and enjoying the beauty of Ohio. Please invite a friend! There is no charge for this program. Brought to you by the Highland Heights Green Task Force, a 501c3 non-profit organization.